Like I said in my previous post, I am pretty psyched up for Valentine's Day this year, and so I have already tackled my mantle for 2013. 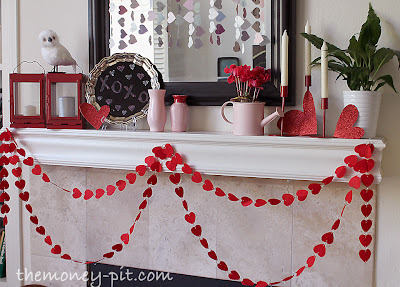 The beauty of Valentine's Day is that pretty much anything red or pink can be put to use in decorating, so I was able to use a bunch of stuff I found on Christmas clearance.. Like these Ikea lanterns (I used in my Christmas mantle) which were less than $5 each. I also found a set of three red candlesticks for $3 (again at Ikea in the Christmas section.) 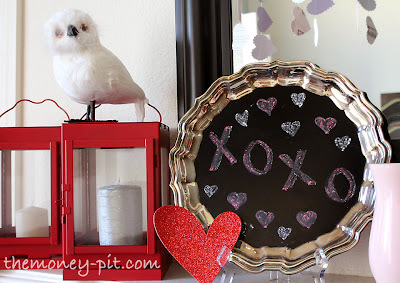 I also reused my chalkboard silver serving tray I made (here) earlier this winter. I did buy a couple Valentine's Day specific decorations, but in my usual form, they came from the dollar store. Since I love a good mantle swag.. 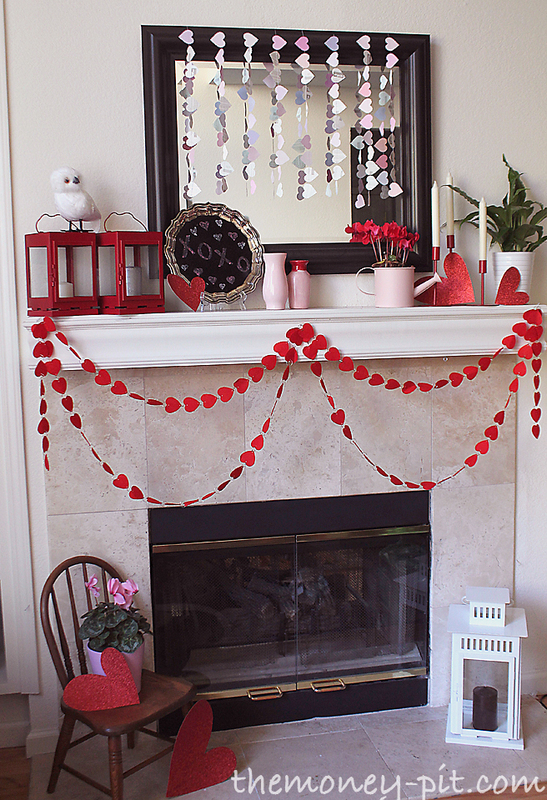 I bought these two felt heart garlands for $1/each (it would have cost me more than a dollar to make them myself). 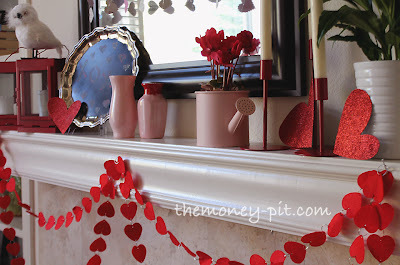 Then I cut up last year's paint chip heart garland and hung them over the mirror. Waste not, want not! I also found a dollar store pink watering can that I added some "outdoor" Cyclamen that were only $2 at Home Depot. Much cheaper than buying the same plants intended for indoors.. you just have to mask the ugly black plastic pots. To round it out I was able to use some of my "faux milkglass" which is just thrift store clear glassware spray painted, and a small vase I got for mother's day a few years ago that my kids painted. A pack of glittered cardboard hearts ($1 at the dollar store) make it clear which holiday I am celebrating. 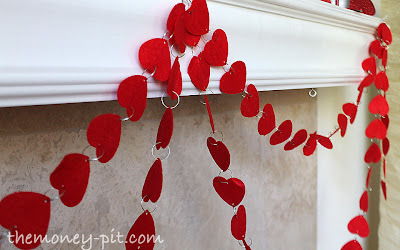 OMG I bought the same felt heart garland... too cute! This mantel is so cute! I love it! The heart garland is adorable! I love the pink and red combination! That little chair is just too cute!